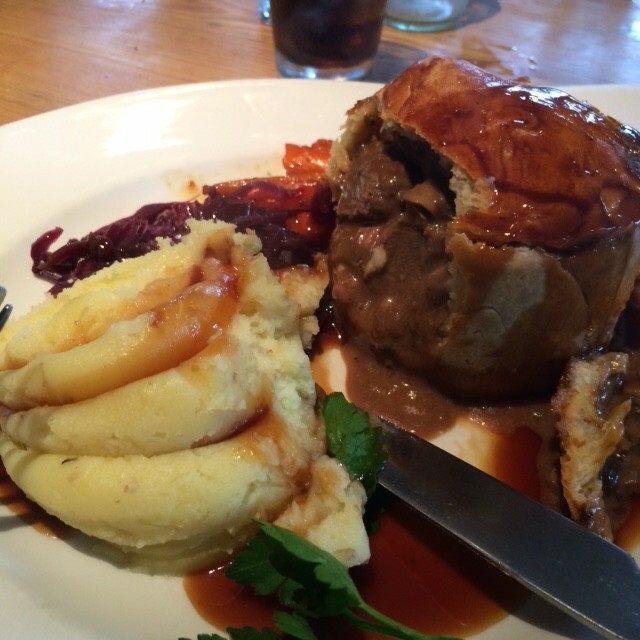 A chance visit to The Old Plough in Cobham, Surrey, prompted a quick return trip and inspired me to write a review. I’m no stranger to a Wetherspoons pub or Michelin-starred dining. Both have their place. However, for me the holy grail is a smart pub that serves great food in nice surroundings. Oh yes, it also needs to be relaxed and friendly (or more specifically family-friendly). On New Year’s Day we decided we were in need of a walk. My husband Matt suggested Norbury Park in Surrey, and we headed out. We were a bit slow leaving, then couldn’t find it, then the girls started moaning that they were hungry. I spotted a pub – The Old Plough – and we swiftly did a U turn. The Old Plough had a real charm but wan’t twee. It was packed. No tables would be available in the restaurant until 3pm. However, we were invited to wait at the bar in case a table became available in the bar area where we’d be able to have the full restaurant menu. We never made it to a table and instead took root at the bar and ordered bar snacks. The bar area was very cosy and featured armchairs and a fire. However, we were more than happy perched on bar stools, with the girls looking worryingly at ease. We went for cocktail sausages with a mustard and honey glaze, nachos and calamari. All three of these can be hit and miss in a pub and have a tendency to be rather heavy and greasy. However, the sausages were really great quality with a perfectly balanced glaze, the calamari had lovely light, crisp batter and the nachos weren’t claggy with cheese; they were actually light with the accompanying salsas really fresh. 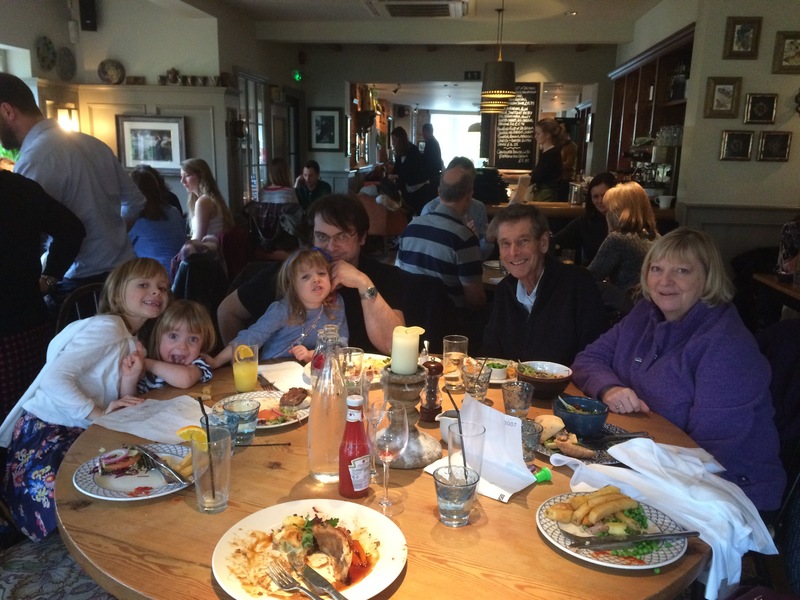 We were very impressed and decided that we’d have to sample the full menu very soon. We headed off for our walk but never did find Norbury Park. Fast forward a week and with my visiting mother- and father-in-law, we returned. This time with a reservation in the restaurant at 12.15pm. We recognised a few people there from last time so knew that it must be popular with locals (usually a good sign). We were immediately escorted to our table. The restaurant wasn’t very busy at that time, but within the hour was packed out. The service was attentive but not overbearing and the menu was quite varied and extensive without trying to do everything. We ordered beef burgers in buns with home cut chips for two of our daughters and sausages, chips and peas for the other. The waitress immediately asked if we wanted the children’s food to come out with the adult starters (which we did). Sausages and burgers can vary tremendously on quality. These were top-notch and although I didn’t try the chips, the other adults who tasted them said they were delicious and crispy. The portions were very large yet reasonably priced. I was the only one drinking and had a glass of Prosecco to start. Matt and I had starters of bang bang peanut satay chicken with crunchy oriental vegetable salad (£7.50) and crispy fried sesame king prawns with wasabi and lime mayonnaise (£7.50). Both were very tasty. Again the batter for the prawns was crispy and light. The salad with the prawns was also oriental in style, very fresh and crunchy. My mother-in-law, mindful that we were having a big curry in the evening, went for a lighter bite of steak, mustard mayonnaise, roasted onions, tomato and rocket served on ciabatta (£7.95). 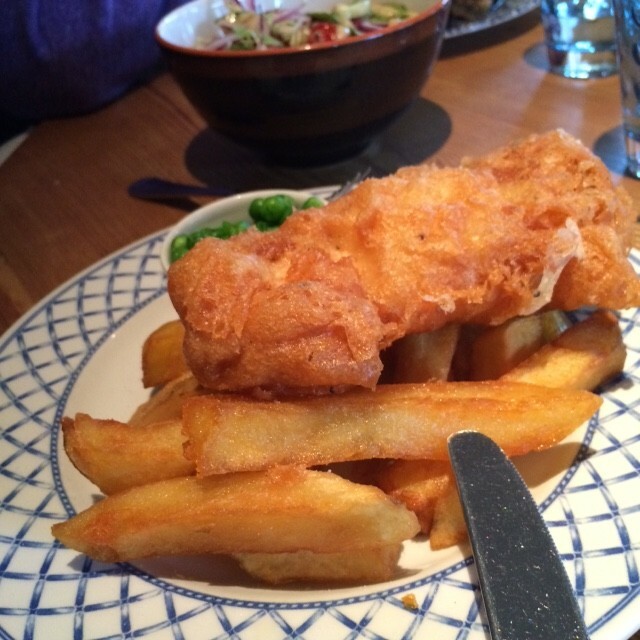 This came served with a choice of soup, salad or home cut chips. They omitted the onions at her request without problem. I’m sure she’d be the first to admit that she can be quite fussy, but it went down very well, with the only criticism being that it was too large a portion to finish! My father-in-law, due to illness, doesn’t have a huge appetite and is rather limited on what he fancies eating. He plumped for a children’s portion of fish and chips. He really enjoyed it and it was great to see him eating well. 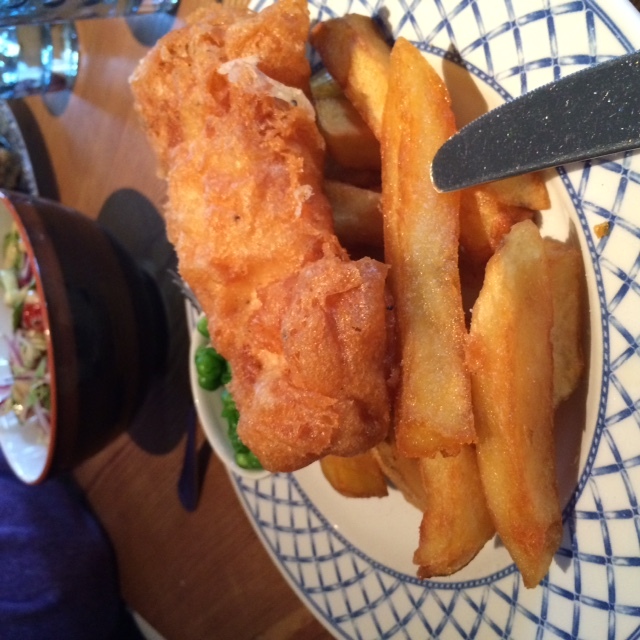 The batter was very nice and crisp and the chips had already had the seal of approval. Matt and I, not so mindful about eating big again for dinner went for one of the specials: Beef, mushroom and blue cheese pastry pie accompanied with mash, honey-glazed carrots and red cabbage (£13.95). The pie was delicious and the mash was wonderfully smooth and creamy. I’m rather a vegetable dodger and cooked carrots are far from a favourite of mine. However, they weren’t soft, soggy and flavourless, instead having a nice bite to them and a lovely sweetness (but not too sweet) courtesy of the glaze. They served plenty of wines by the glass. They also had a list of specials, off which I ordered a very nice and decently-priced Nero d’Avola. I was rather full so bypassed dessert, but my in-laws shared a pistachio cheesecake with greek yoghurt, honey and raspberries (£5.95). The feedback was that it was very tasty, but slightly over-baked. They also had coffees, which they said were very good. Whilst I did a toilet run with the kids, Matt ordered me a Brandy Alexander!?! Although part of the after dinner cocktail menu, it went down amazingly well at lunch. Heavy on the brandy – delicious! We all thoroughly enjoyed our visit and I’m looking forward to returning in the warmer months so we can experience some al fresco dining (and perhaps combine with a visit to nearby Wisley Gardens) but in the meantime would like to go back to try out the evening menu. 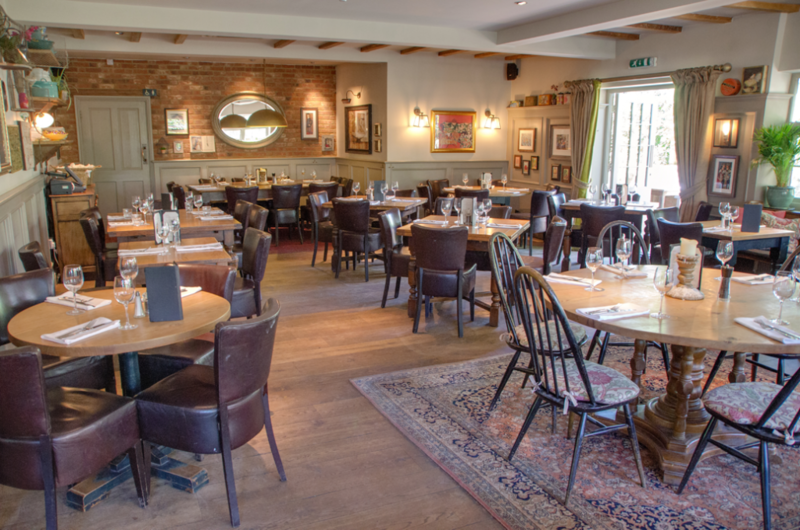 Whilst well-behaved children are very welcome at The Old Plough, they are only allowed in the restaurant until 8pm and in the pub area until 7pm. Also, those expecting packs of colouring books and crayons on arrival for the kids will be disappointed. I personally like that differentiation. You might also be interested in: Date Night at Dans le Noir? It certainly was a delicious lunch, very good menu and not to expensive. The restaurant was very attractive and comfortable. Mike seemed happy being here and as Fran stated, as he is not well and it was good to see him eating his fish/chips. Yes I am a fussy eater as ALL my family will tell you, but would love to have this sort of place near us to eat at once in a blue moon. We look forward to visiting Matt?Fran again and dining here again. Really glad you enjoyed it. I think it has got the right balance: A nice place to go out and enjoy with people, but not stiff and starchy!